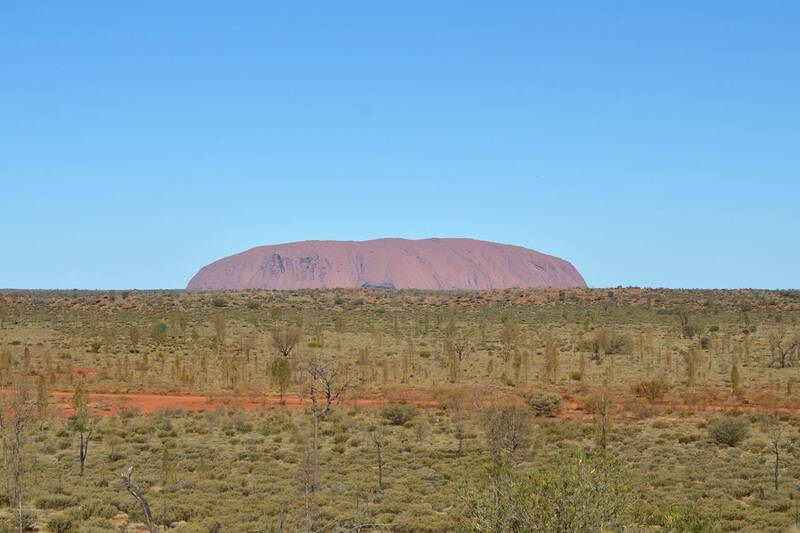 We learned a bit on our visit to the park that protects Uluru above all that we are coming in the middle of school holidays. 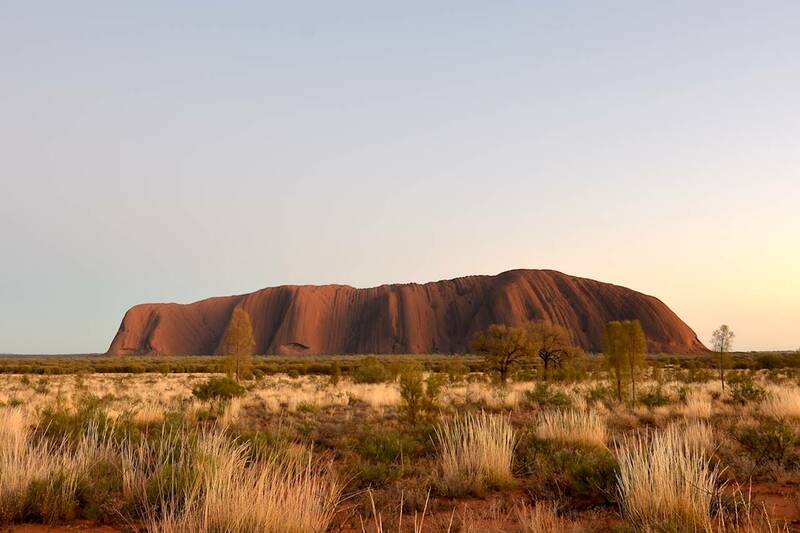 For Aboriginal and for European Australians Uluru is an icon. 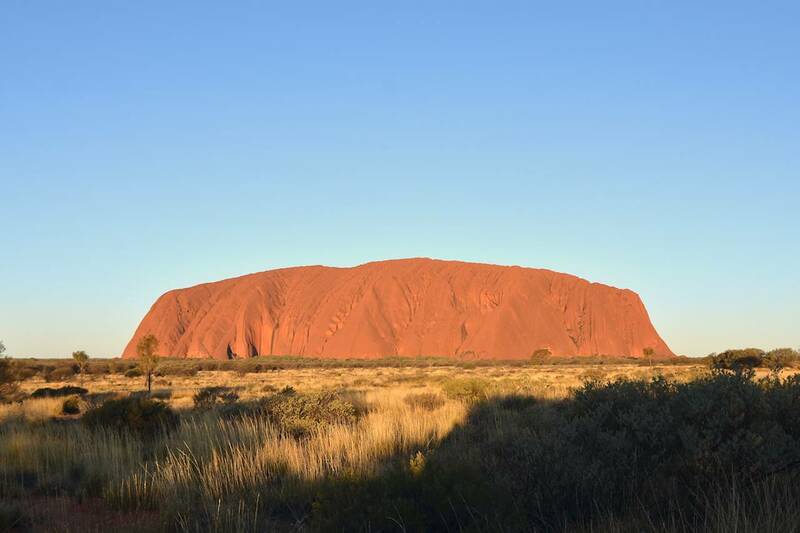 Sacred rock or wonder of nature, the largest monolith in the world is imposing. For tourists it is an obligatory experience. But for us, we came to Australia for the space, and we do not like to be crowded… so we were alarmed when we saw the number of busses disgorging floods of tourists. But bizarrely we were able to enjoy it in complete privacy. 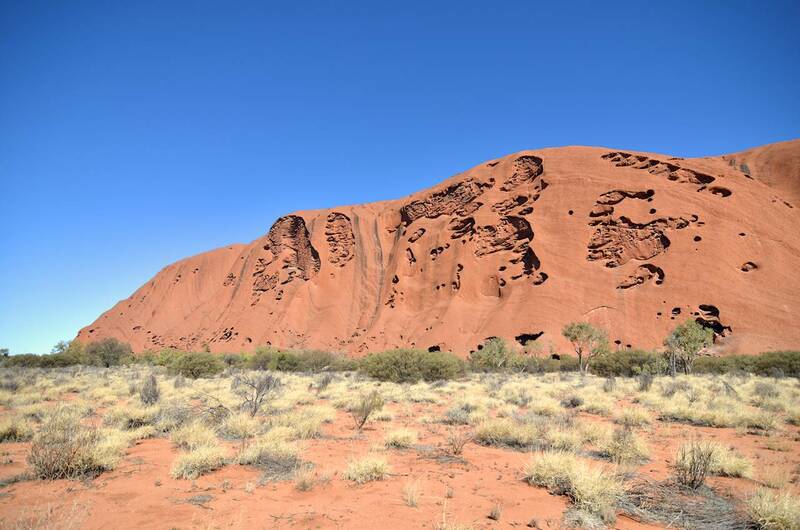 The ten kilometre trail round the base of Uluru is deserted and allowed us to appreciate the sweep and majestic beauty of this titanic rock. 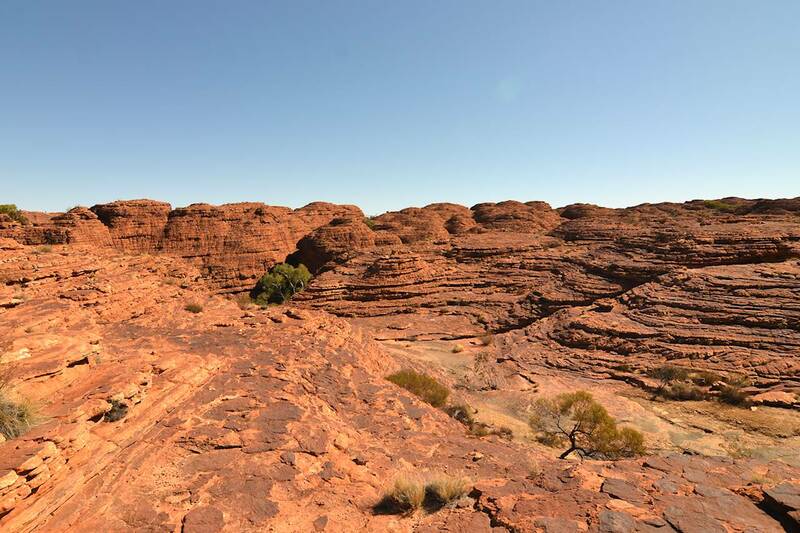 Certain parts are ‘sacred’ and we respected the wish of the Anangu people for these places not to be photographed. 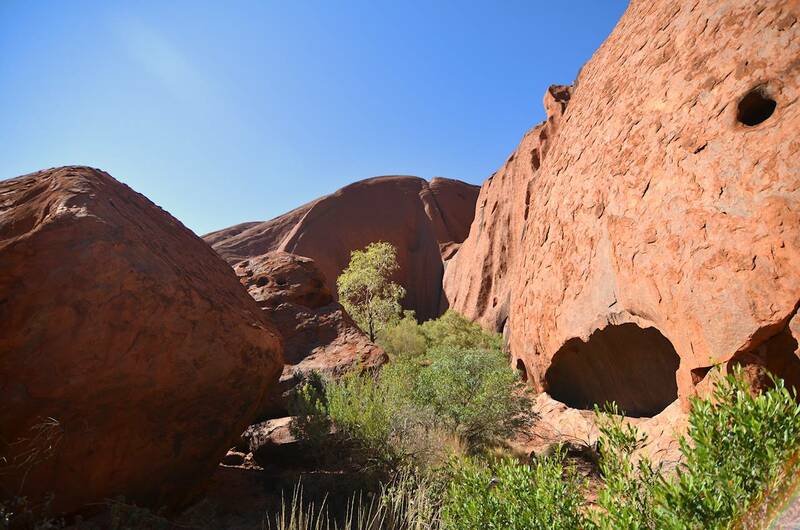 This tranquil walk inspires a certain contemplation, the beauty of Uluru is not only the exterior. Under the surface roil living stories. 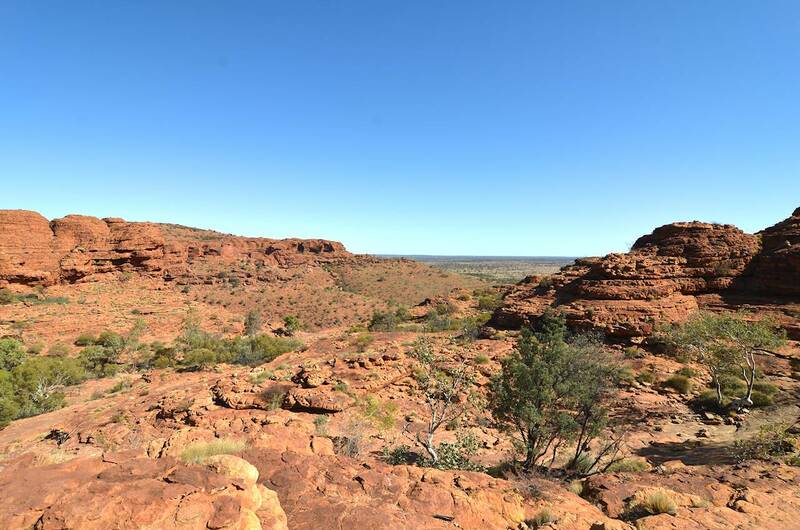 The Mala walk, a short walk guided by a park ranger introduces us to culture of the Anangu, the Aboriginal people who have occupied this region for over 22,000 years. Incredible skills had to be developed to survive in a place like this. 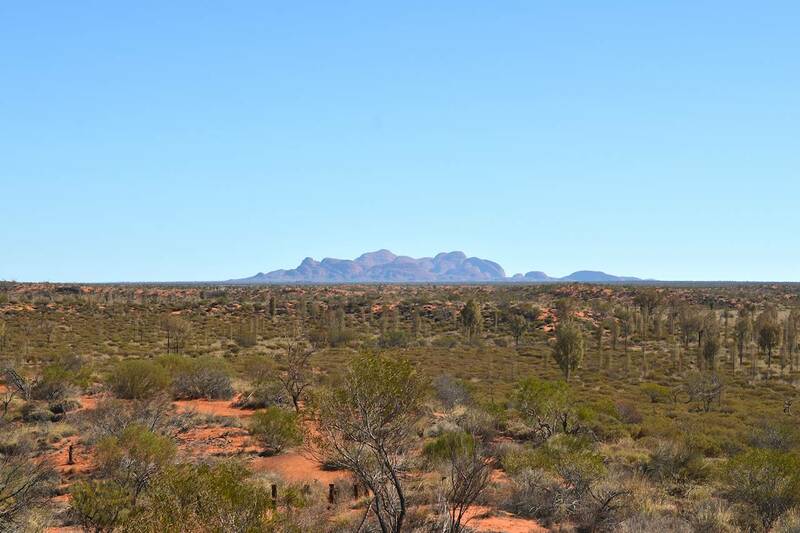 Now the Department of Parks and the Anangu people are trying to work together to restore and protect this place. 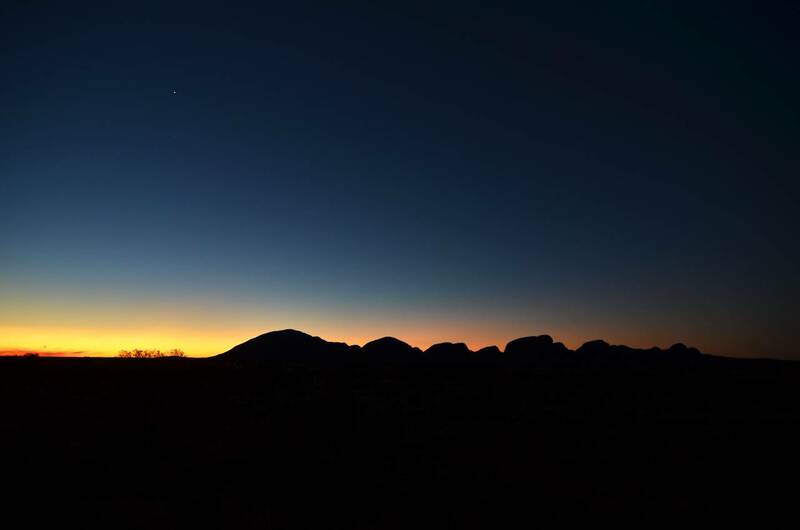 Less known and less visited than Uluru the Kata Tjuta rise 40 Km to the west, breaking the monotony of the line of the horizon. A peaceful little trail winds at the feet of these 38 monoliths. 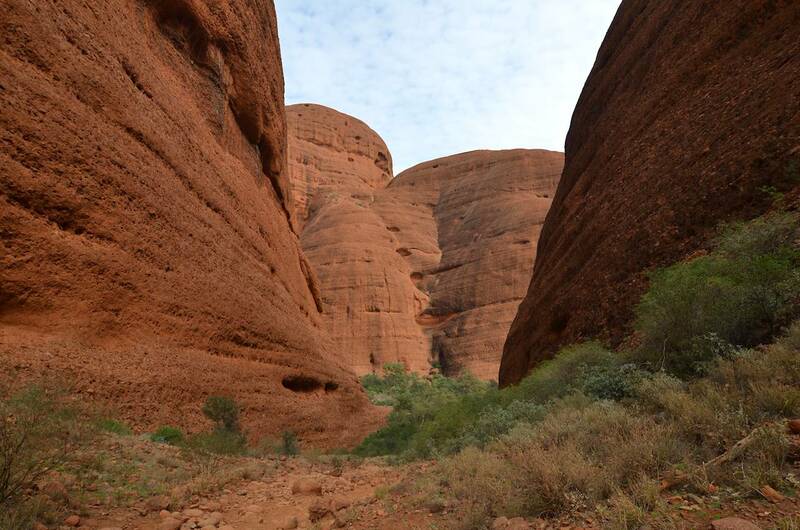 We took the time to feel the importance of the sacredness of this stunning place. But hey, where are all the people?! The crowd crams itself mainly on the platforms for watching the sunrise and sunset on the monoliths… the moment for a snap, then it’s gone once more. Monday the 13th July. 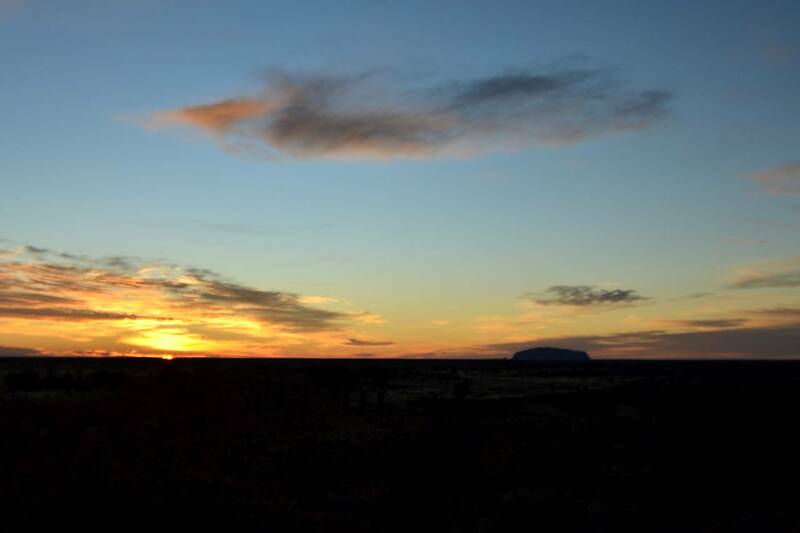 The sun rising on Uluru changing the colour of the rock moving along its length… Red, orange, violet, pink, and the blue of Kata Tjuta far off. People crowd onto the rock summit during the day. 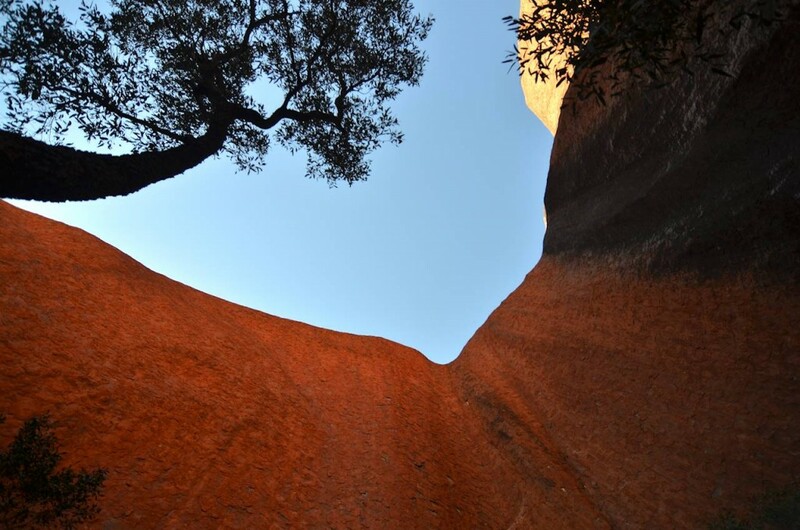 Where the European culture pressures men to climb and plant their flag, the Aboriginal culture asks them to look up from below. 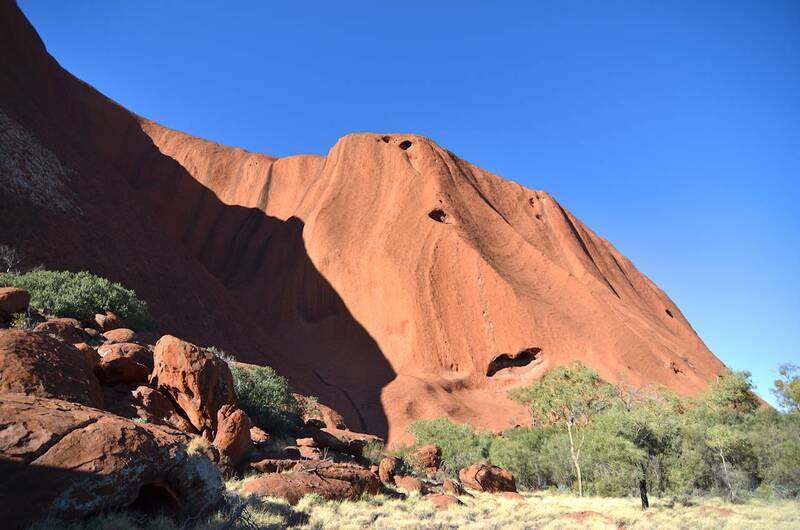 Although this climb is allowed, (there seems to be a complex and unresolved discussion between the Anangu and the government) the park rangers try to dissuade visitors from doing it. The climb is difficult and rescue operations are frequent. 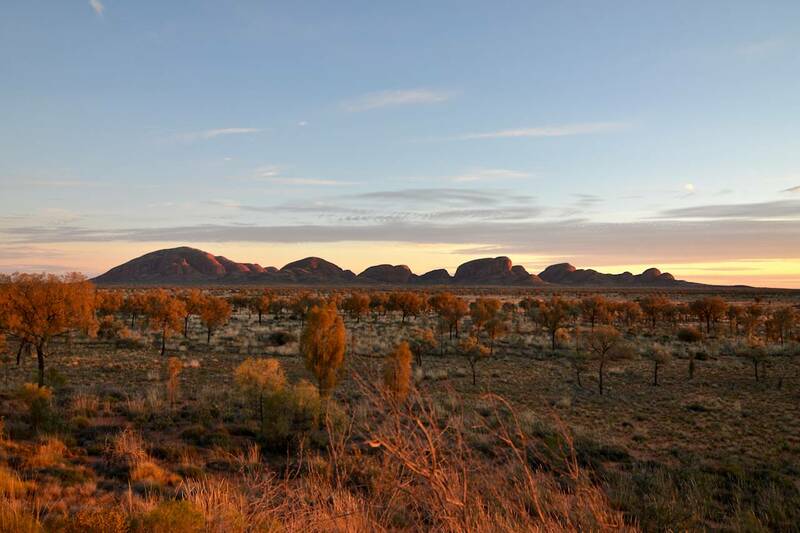 Deaths sadden the Anangu who feel they carry the responsibility. 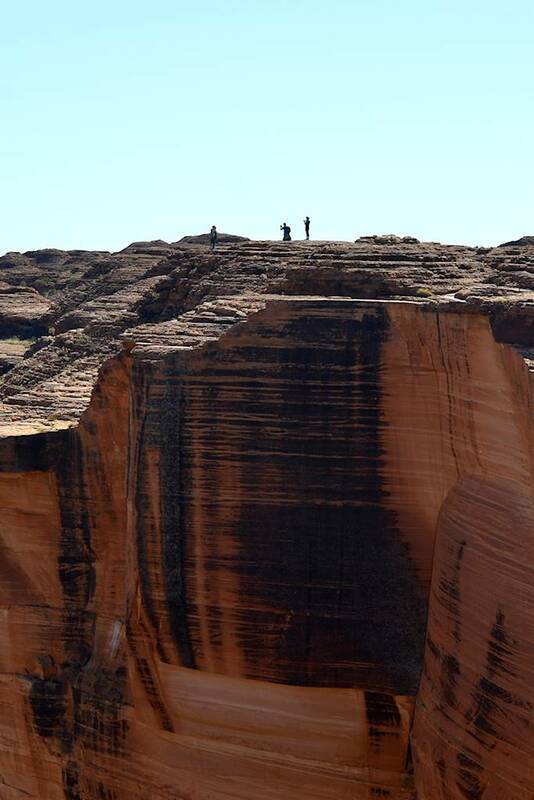 Thousands of steps daily erode the fragile rock, people lose their mobile phones, their cameras, leaving behind a non-negligible amount of toxic rubbish releasing in the heat, and there is even urine in the sacred water-holes at the base of the rock. Would it be too much to ask for some common sense and sensitivity to respect this nature and this culture ? These kings of survival who knew how to protect and even enrich their environment for dozens of thousands of years have much to offer to our modern societies. For us, anyway, this inspires a great deal of respect. 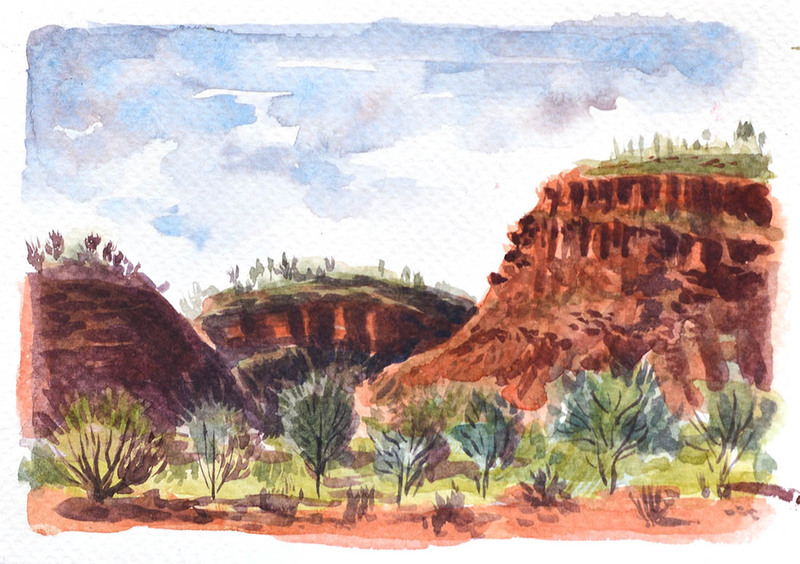 A few hundred kilometres from there, we enter the Watarrka national park. Dry earth and oxidised rock extended as far as the eye could see. 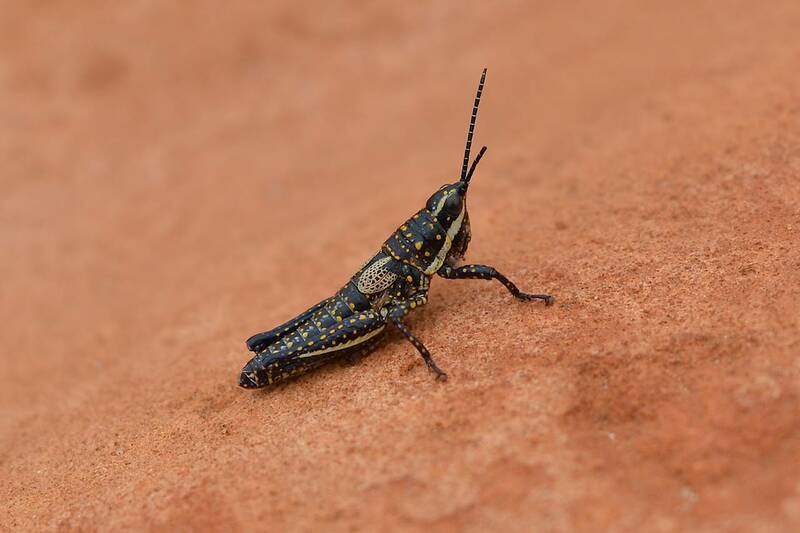 Nothing moves, the dry winter climate does not seem very propitious for life. But along the trail we find some preserved bits of paradise. Life explodes around water sources and shady crevices. 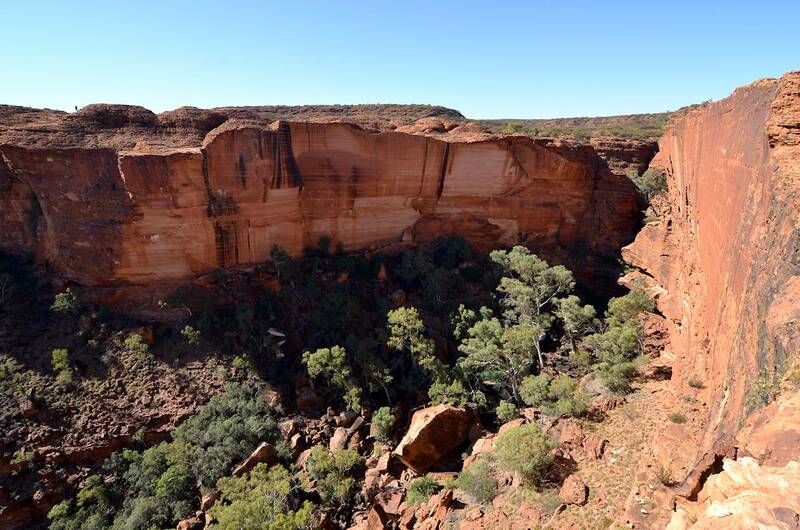 The walk around Kings Canyon is breathtaking. 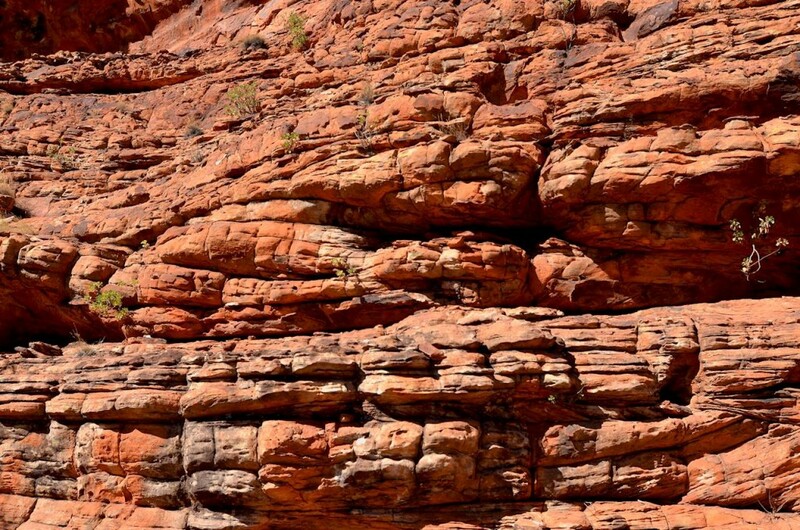 You begin at the bottom of the canyon. The cliffs rise up to the sky. The track climbs in turn to take us to the edge of the precipice. 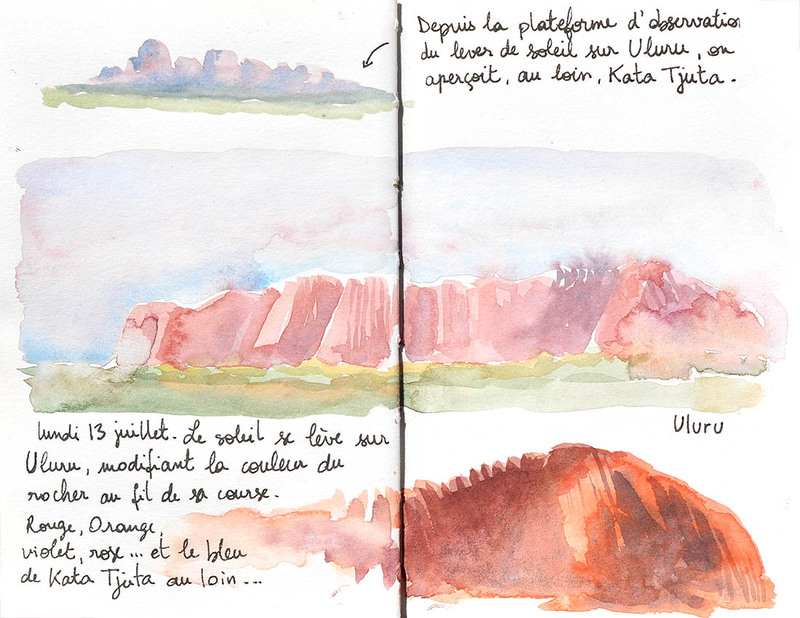 The view is vertiginous, shapes sharp and colours lively. We follow the cliff before going down into the ’Garden of Eden’, a haven of greenery protecting several endemic species and some prehistoric ferns. But we were a bit disappointed not to be able to enjoy the day more quietly. There are too many people. We are more and more upset by noisy people who have no respect… we restrain ourselves from shoving some down the ravine ! We will keep these wonderful images in our memories. We’ll try to avoid tourist sites during holidays next time ! Many thanks to Graham for the translation !